Two weeks ago, I went on a three-day business trip to Kuala Lumpur (KL). 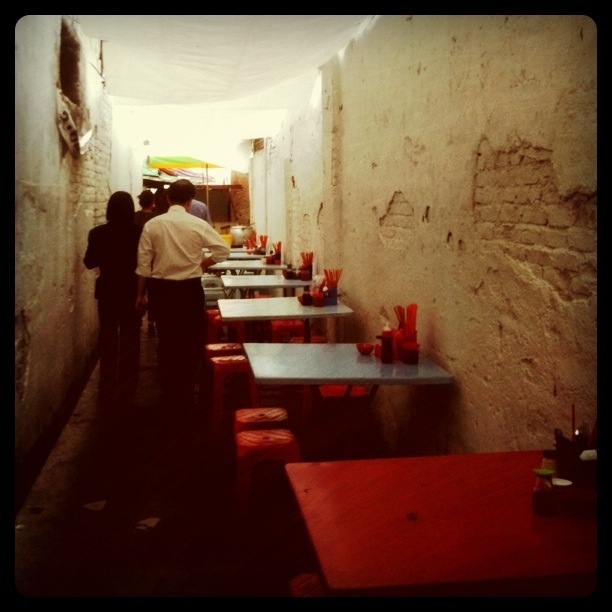 Whenever it was lunchtime, my co-workers would bring me through the snaky dodgy alleys under the scorching hot sun to a depilated but crowded Chinese restaurant. It had slow spinning fans which provided little relief. The air was thick with hot humidity. You had to breathe twice as hard and think cool thoughts while your perspiration slowly seeped through your shirt. The uncle who took our orders knew my drink by heart by the second day. The food was decent and cheap. So I was enjoying my meals and seeing how Malaysians interact with one another. Maybe I was self-conscious but I swear they could sense I was a foreigner. Maybe I had a face that didn’t belong. Maybe I’m just naturally awkward so I’d stand out. But this being only my second trip out of the country for work, I was feeling grown up and super pleased with myself. Even though it was hard for me to get any actual work done because I wasn’t used to working without my office desktop, I was trying to learn as much as I can about the culture, the quirks and the people so I would feel more comfortable. I mean I’ve heard horror stories about the criminal activity in the country, dude, and I fear for my safety. Oh really. Quite why no one remembered to ask me to stay away from the pavements before befuddled me. I cautiously walked further away from the road without panicking like Chicken Little in the “I’m doomed” mode or gasping out loud. Really, I should be awarded for my calm demeanour. Anyway, moving on. I guess it’s full body armour time for me whenever I walk along the streets of KL from now. At least until someone tells me the acid splasher has been caught.